How did a Christian cross come to be installed on City-owned land? In the late 1960s and early 1970s, developers were interested in building condominium complexes on portions of Albany Hill near Pierce St. According to court and county documents, Hubert Call, an Albany Lion and Albany City Council member, bought 1.1 acres of land atop Albany Hill in 1971 and built the illuminated cross on it. He then negotiated 2 years later to sell the land to a developer for about 4 times what he had paid, as part of a deal for the developer to immediately donate the parcel to the City for a public park with the City promising to change the zoning on land on Pierce St. so the developer could build the condominium complex. During the transfer of the deed Mr. Call added an easement granting the Albany Lions Club access to the Albany Hill cross. The propriety of this land deal was questioned and in 1985 the Supreme Court of California ruled the transaction violated conflict of interest laws and ordered Mr. Call to re-pay the funds and to leave the land (with the cross on it) with the City. An easement is a legal right to use someone else’s land for a particular purpose. What does the easement for the Albany Hill cross say? Why was an easement accepted during the land transfer? According to court documents, shortly before the close of escrow, Mr. Call burdened the parcel with the easement and the developer, IGC, offered no objection. The president of IGC testified that although he would not normally have been willing to pay as much for the Calls' parcel with the easement on it, he was fairly indifferent to the creation of the easement on land he was immediately transferring to the City to become a public park. Without objection, therefore, the parcel was burdened with the easement before it was conveyed through a holding company to the City. When accepting the land for the Albany Hill Park, did the Albany City Council know about the easement for the cross? What is the current Albany City Council’s position on the cross? The Albany City Council made that statement to the community in December 2016. At that time the Council updated Albany residents regarding recent activity regarding the cross. The Council informed residents of safety concerns raised about the electrification of the cross, the fact that many residents, a local organization, and two national organizations had approached the City requesting its removal, and that the City Council had “proposed to the Lions Club that the cross be removed and the area be made a nonsectarian gathering place, where a cross could be temporarily raised by Christian groups, but that could be also used by other groups at other times.” The Albany Lions Club response to the City's proposal was to submit a claim threatening litigation against several City officials (see below). You can read the City’s statement and supporting documents here. “The Albany City Council has continued to reach out to the Lions Club through their legal counsel to explore options which we hope will lead to a mutually acceptable solution that is sensitive to the needs of our diverse community and recognizes the contributions made by the Lions Club. We will persist in these efforts and appreciate the input received to date from the public. Further, we encourage you to continue respectfully sharing your concerns with the Lions Club as well as the City Council.” The complete statement can be viewed here. Is the Albany Lions Club suing the City of Albany over the cross? Yes. The Albany Lions Club filed suit against the City of Albany and members of the council and staff on September 11, 2017. 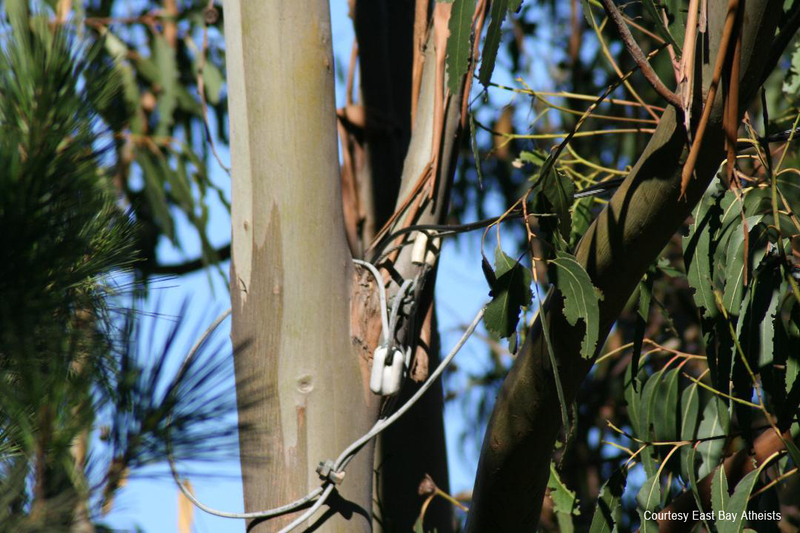 The lawsuit continues a dispute that arose when due to fire safety concerns regarding the wires to the cross attached to a Eucalyptus tree (as seen here and here), the City of Albany requested that PG&E disconnect power to the cross in September 2016. PG&E and the Lions Club later informed the City that the wiring had been corrected and the Lions Club illuminated the cross during the most recent Christmas and Easter seasons. Around this period of repair the Albany Lions Club submitted a claim threatening litigation against the City and recently filed the lawsuit. In its lawsuit the Albany Lions Club is seeking to permanently establish the 20 foot lighted Christian cross on public park land atop Albany Hill and to force the City to sell more than an acre of the surrounding open space park into private hands. The First Amendment to the Constitution states in part “Congress shall make no law respecting an establishment of religion, or prohibiting the free exercise thereof." Thomas Jefferson described this clause as “thus building a wall of separation between Church and State.” Constitutional case law on this subject is extensive, complex, and nuanced. In writing to the City Council, two national organizations have pointed to the case Separation of Church and State Comm. v. City of Eugene as being very similar to the circumstances in Albany: “In that case, private individuals put up a large, lit cross in a donated public park. The Ninth Circuit (court of appeal with jurisdiction over California) held that there was ‘no question that the Latin cross is a symbol of Christianity and that its placement on public land by the City of Eugene violates the Establishment clause’ 93 F.3d at 620. Despite the involvement of private citizens, ‘The maintenance of the cross in a public park by the City of Eugene may reasonably be perceived as providing official approval of one religious faith over others.’ Id. at 619.” You can read the letters to the City here. How have other communities dealt with similar situations? There have been a couple of similar situations recently, one close by in Santa Clara. In both instances the cities and the Lions Clubs have worked collaboratively to move crosses from public to private land. In 2016 the City of Santa Clara and local Lions Club agreed to move a cross erected by the Lions in 1953 from public to private land. In 2015 in La Crescent, Minnesota the local Lions Club and the city agreed to move a cross from public to private land. The Albany City Council has similarly proposed that if the Albany Lions Club wishes, they can take possession of the removed cross. It could be placed on private land in accordance with any applicable city regulations. Who maintains the cross today? The Albany Lions Club erected the current cross in the early 1970’s and still maintains it today by way of easement, see above. When is the cross illuminated? The Albany Lions Club typically turns on the cross’ lights for a few weeks around the Christian holidays of Easter and Christmas. The cross is visible from afar, even when not lit, including to thousands of travelers in elevated BART trains going through Albany. Who pays for the electricity to illuminate the cross? Was there a cross on Albany Hill prior to the current one? Yes. The history of crosses on Albany Hill is a complex one. It’s possible that the earliest crosses on Albany Hill may have been crosses burned by the KKK in the 1920’s (see “Did the Ku Klux Klan burn crosses on Albany Hill?” below). In 1929 the Albany Community Church conducted what appears to be the first Easter sunrise service on Albany Hill (“Church Will Greet Sunrise from Hilltop,” Oakland Tribune, March 30,1929). In 1933 the Oakland Tribune reported that a cross would be erected during Easter services on the hilltop led by Stege Presbyterian church (“Easter Service on Cerrito Hill,” Oakland Tribune April 6, 1933). By 1940 a cross was erected during Easter season by the Albany Fire Department (Berkeley Daily Gazette, March 19th, 1940) but the practice was later discontinued. The Albany Lions Club erected the current cross in the early 1970’s during a complex and ultimately improper land deal, see above. How might the removal of the cross impact Easter services on Albany Hill? This tradition can continue without the permanent installation of a cross on the public park land. As part of a proposal to remove the cross from the public park, the City has proposed to the Lions Club that the City will build a small platform in its place that would allow for temporary raising of a cross during a permitted Easter service. The small platform could be used by other faiths or for non-religious functions. Did the Ku Klux Klan burn crosses on Albany Hill? Possibly. In 2000, a KTVU news series, “A Second Look” did a segment on KKK activity in the Bay Area in the 1920’s. The reporter, Faith Fancher, states "Cross burnings were common. Albany Hill, now the site of modern condos, was a spot favored by the Klan, as was Cragmont Park in Berkeley near Grizzly Peak. 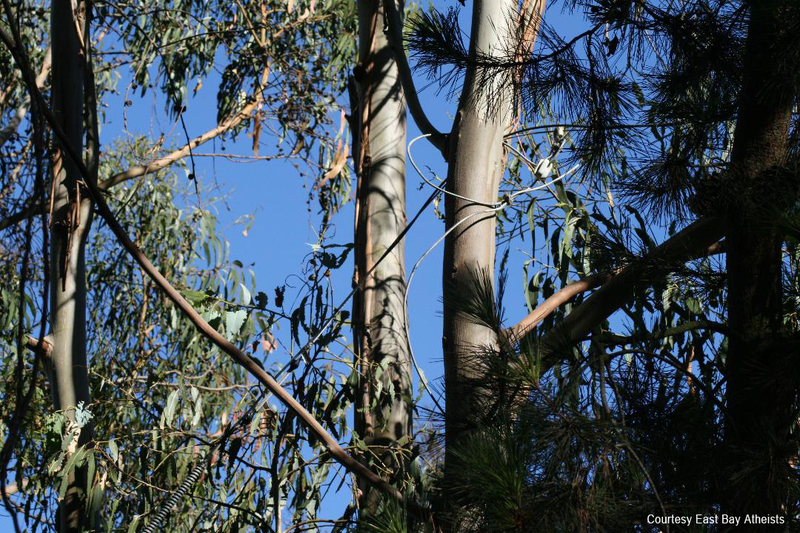 In the 1920's these East Bay Hills were alive with the symbol of hate - cross burnings so bright that witnesses said you could see them from Pinole to Berkeley." The Berkeley Daily Gazette, April 2nd 1923 reported the Klan cross burning in Berkeley’s Cragmont Park and east bay newspapers reported over a dozen nearby hilltop KKK cross burnings between 1922-26. We are not aware of a primary source to corroborate cross burning on Albany Hill though research on the issue continues. Is Albany Hill Park 4 All opposed to the Albany Lions Club? No. We recognize that the Albany Lions Club has a long history of wonderful service in the Albany community. We respect and support their core mission of community service. We ask that the Albany Lions Club adhere to their own organizations rules and purposes. Lions International has 46,000 chapters in over 200 countries and territories with people of many different faiths. The parent organization mandates clubs to support their local communities and explicitly says they are to be nonsectarian and apolitical. The Berkeley Lions Club has gone on record opposing the position of the Albany Lions Club and called on them to compromise with the City to resolve the issue. You can read more from the Berkeley Lions Club here and more about the Lions Club mission here. Is Albany Hill Park 4 All against Christianity? No. Because the cross is situated on public land, many Albany residents of a variety of faith traditions as well as those of no faith want to see the cross removed in order to promote and affirm a more inclusive “all are welcome” message as a City. Several Christian ministers who either live in, or lead congregations in, Albany have advocated to the City Council for the removal of the Albany Hill cross for this reason. What is Albany Hill Park 4 All? Albany Hill Park 4 All is a coalition of Albany residents organized to support our elected City Council's unanimous position that the presence of the cross in the Albany Hill public park is inappropriate and at odds with the inclusive values the City encourages. We are members of faith communities and adherents of no faith, members of community service organizations, AUSD parents, environmentalists, and members of civil rights organizations. We believe building a welcoming and inclusive community is a priority and will ultimately improve Albany for all of us. Did we get something Wrong? Albany Hill Park 4 All is a grassroots volunteer effort. We have conducted substantial research into the facts surrounding the cross in Albany Hill Park and where possible have provided citations and links to case law, city documents, newspaper articles and other materials. Any inaccuracies or mistakes are unintentional and we ask you to let us know so we can correct any misstatements. Thank you. Just ask! Submit your question.